Our doctors recommend that adults should have a routine checkup and cleaning at least every 6 months. 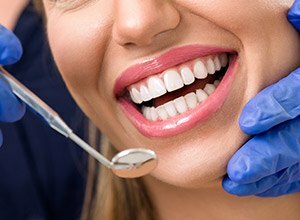 During these appointments, we’ll clean away and break up the plaque and tartar on your teeth that your brush and floss consistently miss, and then, one of our doctors will give you a thorough oral exam. They’ll look for things like tooth decay, cavities, gum disease, and a host of other potential problems. 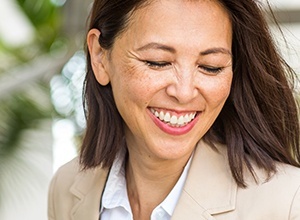 By coming to see us regularly, we’ll be able to catch any issues you have early and treat them conservatively, which will help keep your smile healthier and stronger in the future. Oral cancer is fast becoming one of the most deadly despite also being one of the most treatable. This is because it is often caught in its later stages when recovery is very unlikely. 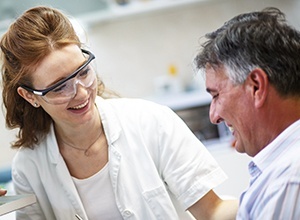 To make sure this disease never catches you or a loved one off guard, we recommend that you should have an oral cancer screening at least once a year. We can actually perform one during your regular checkup, during which we’ll examine your lips, gums, tongue, cheeks, throat, and neck for any signs of the disease. If we find anything, we can advise you on how to take appropriate action. Nearly 1 in 3 people unconsciously clench their jaw and grind their teeth while they sleep, and the name of this condition is bruxism. This can tire and strain the muscles in the jaw as well as severely wear down the teeth until they crack and break. Fortunately, we have a very effective solution for this sneaky problem. It’s a custom-made mouthpiece called a nightguard. It works by providing a protective barrier between the teeth so they can’t be damaged during the night, and because every one is made to fit each patient’s particular teeth, they’re always very comfortable to wear. Fluoride is absolutely essential for a child’s teeth while they are still developing, but did you know adult teeth need it as well? Many people aren’t getting fluoride in their diet due to an over-reliance on bottled water, and this can make the teeth more vulnerable to developing cavities. 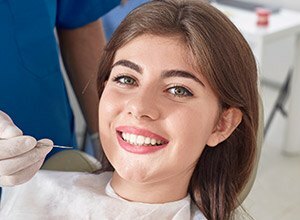 To give your teeth a bit of extra protection, we can have you briefly wear a mouth tray that is filled with a highly-concentrated fluoride solution. 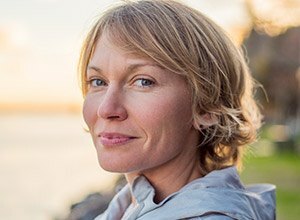 It’s quick, it’s easy, and it’s one of the best ways we can keep your teeth cavity-free. If you participate in any kind of sport, whether it is contact or otherwise, you should always hit the field, mat, or court with a protective mouthguard. 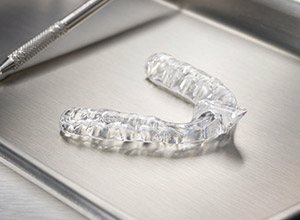 Dental injuries actually account for up to 40% of all sports injuries, and they can often be completely avoided by simply wearing a mouthguard. We can fabricate a custom one made just for your smile at Four Town Dental. It’ll fit your teeth better than anything you can buy at the store, plus it’ll do a much better job of defending your smile. Periodontal therapy specifically focuses on treating the gums and bone that surround and support your teeth. When it comes to your oral health, they are just as important as your teeth. While the teeth must be protected from decay, the gums must also be protected from gum disease. If we see that you have any signs of this infection (such as red, swollen, or tender gums), we can quickly utilize an array of treatments specifically geared towards managing and eliminating it. If you have any questions about the services on this page, or if you’d like to schedule a preventive appointment, simply contact our office today.